There’s been a lot of change coming at a fairly quick pace from Facebook lately for Page administrators. If you’re someone who manages a church or organization Page, here are five new things that will be helpful for you. Third party apps, like Hootsuite, used to be the only way to schedule a Facebook post in advance. Now that’s built right in to the Facebook site. To schedule a post, click on the little clock in the lower left hand corner of the status box. (You won’t see the clock unless you have clicked your curser in the status field.) Click on “add year” and keep going down the line to month, day, hour and minute. Then click “Schedule.” This is great for working in advance or scheduling stuff to post on the weekend or evening when you may not be right by a computer. As a way to help more people see your post, you can now promote it. This is another type of Facebook advertising where, for a fee, you can force your post into more of your fans’ News Feeds. It will be discreetly labeled as “sponsored.” When you choose “Promote” in the bottom right corner of a post, Facebook will tell you how much it will cost to increase your reach. Honestly, it’s hard to tell how useful post promotion will be until we start to see how people react to having paid content in their feeds. But it could be useful for promoting a big event or important thing going on at your church. 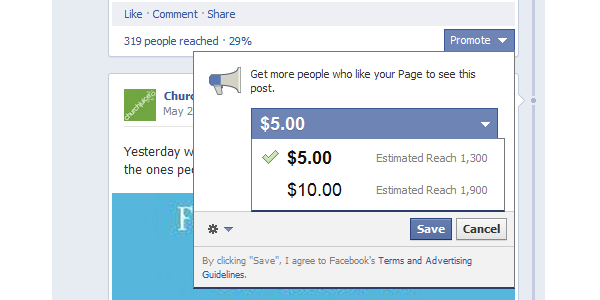 You can also choose to promote a scheduled post. Previously, every Page administrator had the same level of power. Now there are different levels you can assign people. 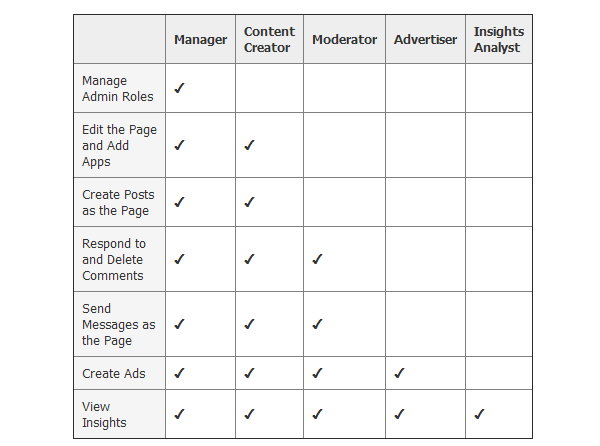 Facebook has put together this chart to explain what powers come with each role. Facebook rolled out a Pages Manager app for Apple iOS that’s separate from the regular app. It just displays information and notifications for the organization Pages you manage. Plus you have access to some basic Insight analytics. For me, this app seems to make it easier to view notifications and comments on a Page than the regular app.